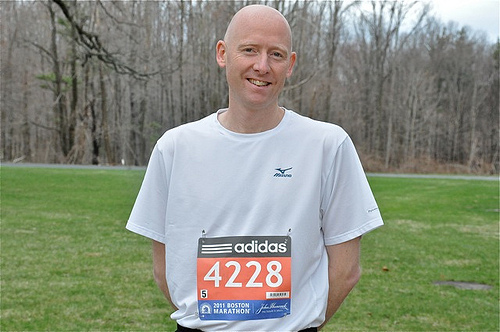 I ran the Boston Marathon. That's why we do it. To say those five words. In running circles, qualifying for the world's oldest marathon affords bragging rights. And, I must confess that after the success of my first marathon, further ego gratification was a significant part of my mission. But my second marathon didn't go according to plan. I got off to a strong start and felt good through the Wellesley Scream Tunnel, but by mile 20, it was my knees that were screaming, and I was seriously fearing a DNF. So, for the first time ever in a race, I walked. I walked up Heartbreak Hill. I walked past the Citgo Sign. I walked past thousands of cheering fans, whilst thousands of runners passed me. It was a difficult, chastening experience. But, I was one of the fastest walkers. And I did finish. And my Mum, Dad, and Sister were waiting at the end to celebrate. And I received wonderful messages from friends. Heck, I even got a word of support from AOTUS. Upon reflection, I wouldn't change a moment of my marathon, because it's not about winning or running fast or even about finishing the race. A marathon is about trying something difficult, giving it your best, and being truly inspired and humbled by those who cheer you on. Count on there being a coterie of us cheer-ers along these paths you're running, Peter. I didn't used to think of sideline cheering as "participation," but to the extent that what you the runner/writer/leader get out of it is a humbling sort of inspiration ... that's exactly what *we* the people cheering and reading and being led get out of your arduous marathon-ing. So yeah: more marathons please! Even after all these years, every Patriot's Day I get a rush reliving the Boston Marathon experience. Welcome to the club!